Join Sean O’Hagan as he delves into the work and practice of photographer Alys Tomlinson. Tomlinson will be presenting her latest project Ex-Voto (2014-2018) – A handwritten note neatly folded and hidden in the crevice of a rock, crosses etched onto stone, ribbon carefully wrapped around piles of twigs. These are all offerings of religious devotion, known as ‘Ex-Voto’ and found at Christian pilgrimage sites worldwide. Often placed anonymously and hidden from view, pilgrims leave ex-voto as expressions of hope and gratitude, creating a tangible narrative between faith, person and the landscape. 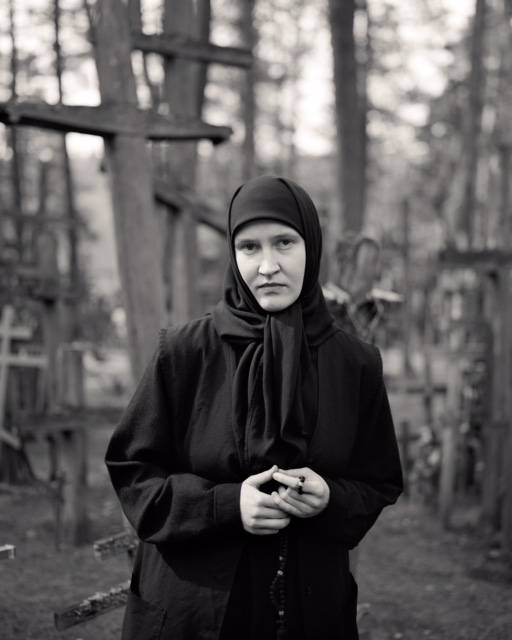 Taken at the pilgrimage sites of Lourdes, France, Ballyvourney, Ireland, and Grabarka, Poland, the project images encompass formal portraiture, large format landscape and small, detailed still-life shots of the objects and markers left behind. Shot on 5×4, large format film, the images evoke a distinct stillness and reflect the mysterious, timeless quality present at these sites of great spiritual contemplation. People and landscape merge as place, memory and history entwine. ‘Ex-Voto’ will be published as a book by GOST in Spring 2019. View the Kickstarter here. Having grown up in Brighton, Alys Tomlinson studied English Literature and Communications at the University of Leeds and then photography at Central Saint Martins. She recently completed an MA (Distinction) in Anthropology at SOAS, University of London. Alys is most interested in the relationship between people and place, exploring themes of environment, belonging and identity. She lives in London and combines commissioned work for editorial, design and advertising clients with personal work, which she publishes and exhibits. Alys’ work has been exhibited in the UK, France, Ireland and the USA. Projects have been published in a range of newspapers and magazines including Le Monde, The Guardian, Creative Review, British Journal of Photography and Vanity Fair Italia. ‘Ex-Voto’ and interviews with Alys also featured recently on BBC’s Newsnight and the BBC News. Alys was recently named Sony World Photographer of the Year 2018. Sony World Photography Awards, 1st Prize (Discovery Category), Taylor Wessing Portrait Prize (National Portrait Gallery), BJP/International Photography Award Shortlist, Renaissance Photography Prize (Finalist), Hotshoe Award/Renaissance Photography Prize Winner, Magenta Foundation Flash Forward and PDN 30. Sean O’Hagan is the Guardian’s photography critic and a feature writer on art and culture for the Observer. He was given the 2011 J Dudley Johnston award from the Royal Photographic Society “for major achievement in the field of photographic criticism” for his writing in the Observer and the Guardian. He has written introductory essays for Strange and Familiar: Britain as Revealed by International Photographers (Prestel 2016); Another Kind of Life: Photography on the Margins (Prestel 2018); Terra Nostra by Mimi Mollica (Dewi Lewis, 2017); Chloe Dewe Mathews: Caspian: The Elements by Chloe Dewe Mathews (Aperture and Peabody Museum Press, 2018). He recently curated The Lost Moment – Civil Rights, Street Protest and Resistance, 1968-69 at The Gallery of Photography, Ireland, 2018.